2T - $40.99 Only 8 left! Just kidding! That Queen fell off a cliff a few years ago…but we do know a Snow White when we see one, and guess what, parents - sounds like you’ve landed a little darling who’s the fairest in all the land! Being compared to Snow White is a tall order…known for being kind, gentle, energetic and cheerful, she’s got all the qualities that make a bunch of dwarves - even the grumpy ones - fall in love with her compassionate nature. But don’t let all that sweetness fool you: She’s as brave, resourceful, and determined as they come! So if your petite princess loves her dwarves and animal friends, then this Snow White Classic Toddler Costume will be the perfect thing for her to wear during her woodland-dwelling adventures! 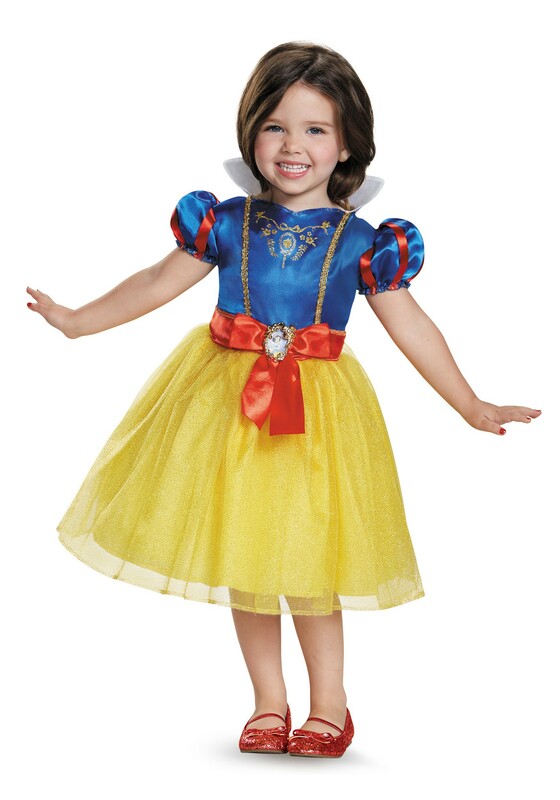 Modeled after Snow White's iconic dress with a blue bodice, puffy red and blue striped sleeves, a yellow skirt, and a high white collar, there will be no mistaking who's the fairest of them all when your little girl is wearing this costume! Add some yellow or red shoes and a red cape for a complete Disney Princess look. Heigh-ho, heigh-ho...off to imagination land she'll go!